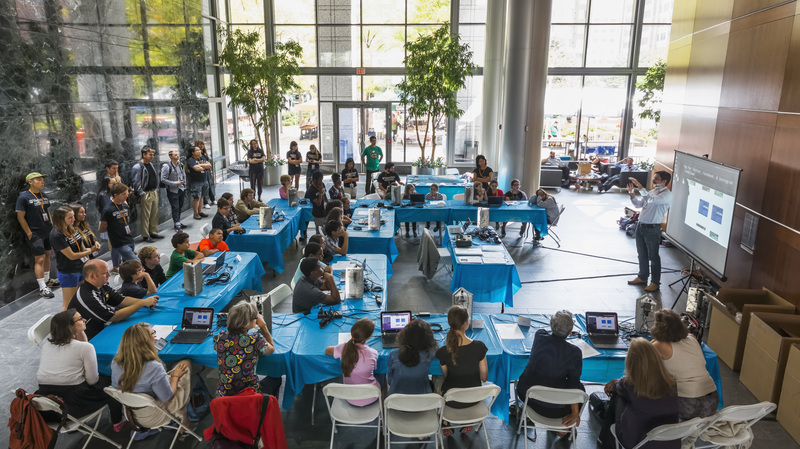 A constellation of up to 50 cloudlets that made up the Cloud, a networked sculpture that brings together technology and the arts for an interactive, community-created experience, transformed a central space of Welburn Square in Ballston, Virginia. The cloudlets emit light and sound in response to light and sound generated by other cloudlets, people, and the environment. Each cloudlet’s aluminum honeycomb and acrylic vessel contains a Raspberry Pi microcomputer, light sensors, microphone, multi-color LEDs, and a small speaker. These components are driven by a custom version of Virginia Tech’s Pd-L2Ork open source software for audio, video, and graphics processing. As part of a series of workshops, 50 teams from businesses, organizations, and schools were given an opportunity to customize the behaviors of the cloudlets and placed them in Welburn Square. The Cloud grew cumulatively as more people joined and added their unique perspectives. The project is funded by the Ballston Business Improvement District, and the following organizations from Virginia Tech: Institute for Creativity, Arts, and Technology; Institute for Society, Culture and Environment; Virginia Tech Research Center – Arlington; College of Architecture and Urban Studies; College of Liberal Arts and Human Sciences; Information Technology; and the School of Performing Arts. Sponsorship and in-kind donations are provided by the Hilton Arlington, Residence Inn Arlington Ballston, Modern Devices, Plascore Inc., and Holen Aluminum Products. Photos by Jeff Goldberg. Video by Danny Kang. Virginia Tech National Capital Region building, Arlington, VA. October 4-31, 2014. Public Displays of Innovation at the Artisphere Gallery Arlington, VA. November 26, 2014-January 18, 2015. University of Maryland Kibel Gallery with workshop, College Park, MD, January 9-July 31, 2015. Open at the Source Virginia Tech Horton Gallery, Blacksburg, VA, April 23-May 17, 2015. New Interfaces for Musical Expression international conference with workshop, Louisiana State University, Baton Rouge, LA, May 31-June 2, 2015. Shaw Center, Baton Rouge, LA, June 3-28, 2015.
International Computer Music Conference with workshop, University of North Texas, Denton, TX, September 25-October 1, 2015.